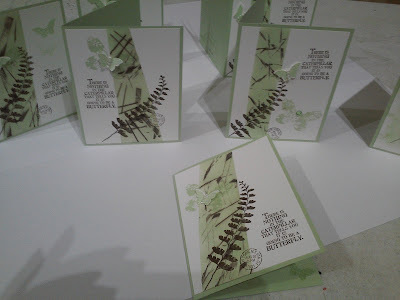 Art Gallery Cards: Neat and Easy Bokeh and Rubber Band Backgrounds! Thank you for stopping by!!!! We had a fun time this past Monday at the Gallery, replicating some card ideas that I got from my friend, Linda Williamson, a fellow Stampin' Up Demo in South Carolina. Her cards are always clean so perfectly neat. But.....Linda does not spare the layers. That little bit of the white frame showing in the Bokeh card really makes it pop! A word about our background. We used sponges and ink pads rather than, aquapens and re-inkers. 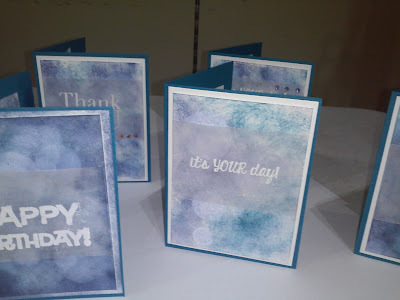 I love both techniques but with a total of 16 stampers I opted for the Island Indigo and Night of Navy stamp pads! The template is made by using Circles framelits on a 4x5 piece of a Window Sheet. Thank you for the inspiration, Linda!! We made our circles with sponge daubers and a Whisper White Craft Stamp Pad. It lightens as it dries, giving you a beautiful background design and everyone's background is different!! We also used Linda's idea of adding a strip of vellum, embossed with Whisper White for our sentiment. Very pretty! The rubber band stamping was so fun and easy peasy!! We masked off our background with post-its and stamped with Early Espresso and our acrylic block that was wrapped with rubber bands. We then sponged the area with (goodbye, our friend) the Pistachio Pudding stamp pad. Our base is what is left of my Pistachio cardstock! We sent it off in style, I think! Give these two techniques a try! !